A Conservative election candidate in Sussex has been suspended over doubts about his claim to be a war veteran. 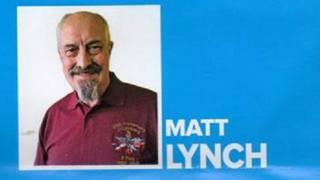 Matt Lynch is due to stand in the Hastings local election on Thursday. In his campaigning profile - which has now been removed from the local party website - Mr Lynch claimed he served in the British Army for 14 years. Members of the local regiment said they do not believe this to be correct. Mr Lynch has not replied to the BBC's requests for an interview. Steven Flynn served with the 3rd Parachute Regiment in the Falklands War when he was 19. He was the first to raise doubts about Mr Lynch with the Hastings and Rye Conservative Association, after hearing Mr Lynch claim he served 12 years with 2 Para and fought in the Falklands. Mr Flynn made his own inquiries with former servicemen and said: "To this day no one knows of him [Lynch]. "It's an insult to most people and their families. There were men who died on Mount Longdon who never saw their newborn baby. It's an insult to them." A Conservative Party spokesman said: "Matthew Lynch has been suspended pending an investigation." His name will still appear on the ballot papers in the St Helen's ward, as the latest date for withdrawal has now passed. The Hastings and Rye Conservative Association has been contacted for a comment.